Liquid Sky Lacquer is an indie brand that has been around ever since I started nail art (September 2012!) but I have never tried their polishes… until now that is! I’ve got swatches of their Valentine’s Day 2016 Collection along with a special thermal to share with you all! 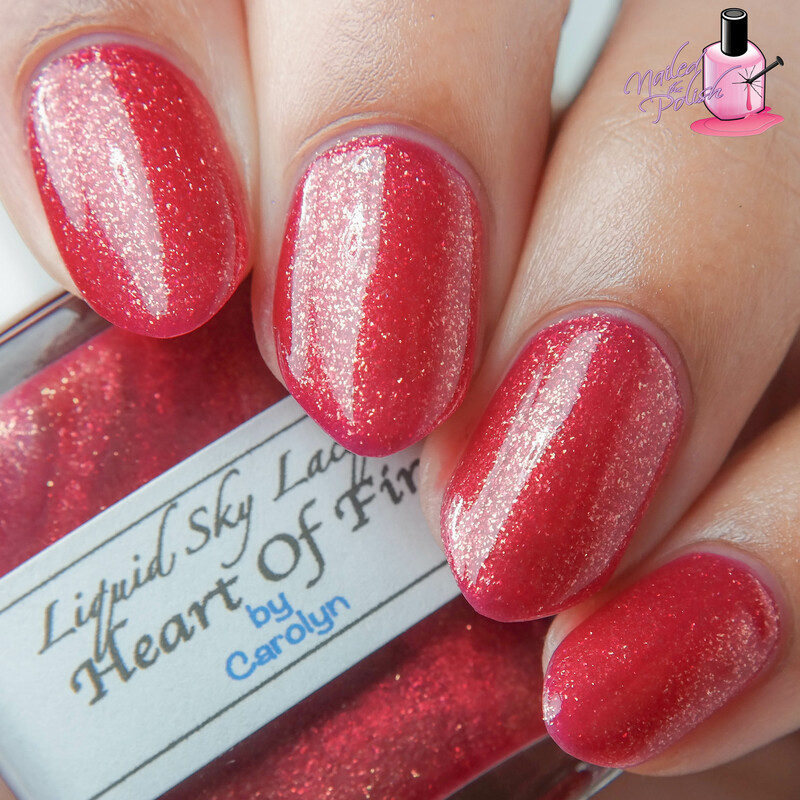 Heart of Fire is a bright crimson red polish with lots of golden shimmer. Shown here is three coats plus top coat. This polish is a little bit sheer but it’s very easy to apply and builds opacity well. It also levels and dries great! I love how the added shimmer gives this polish a flame like effect – so cool! 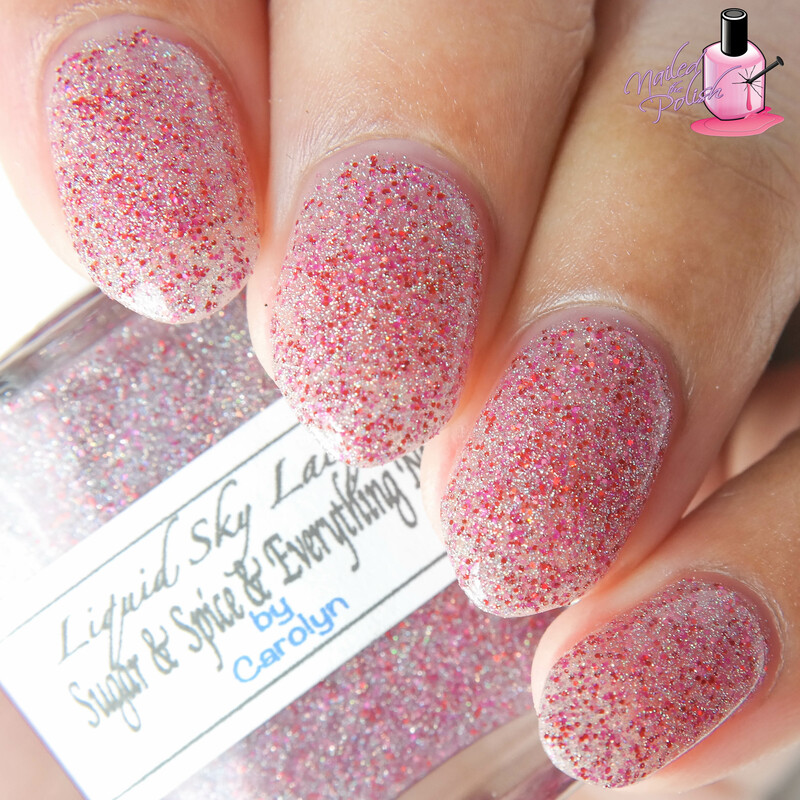 Sugar & Spice & Everything Nice is a lightly textured glitter with very fine silver holographic, red, and magenta micro glitters. Shown here is three coats plus top coat. This polish has a great glitter to base ratio. The glitters distribute exceptionally well and you don’t have to fiddle with them to get them to stay. I really like the speckled look of this polish! 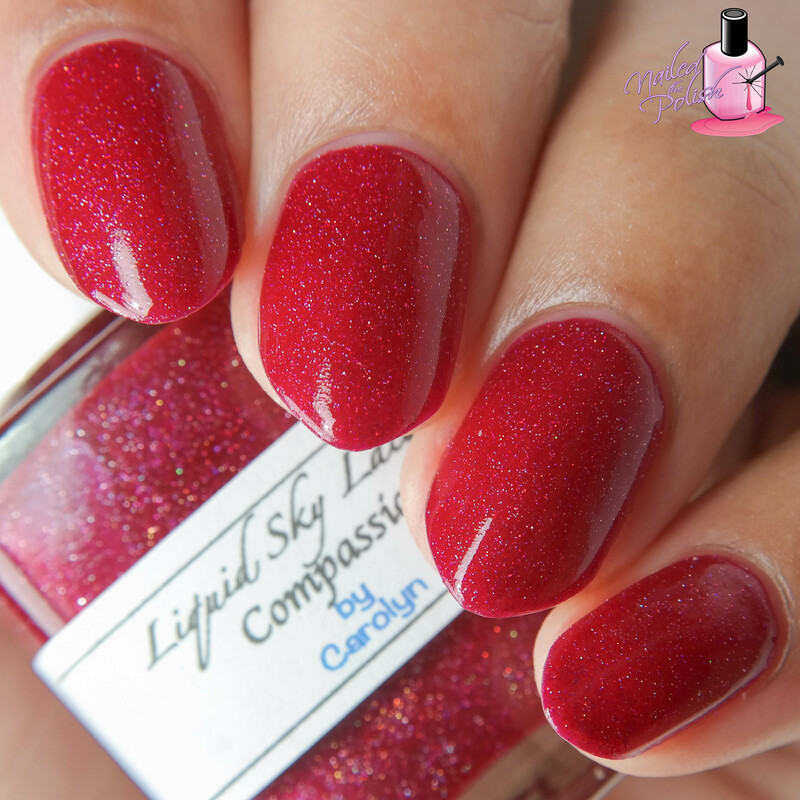 The red and magenta micro glitters give this polish a perfect pop of color. 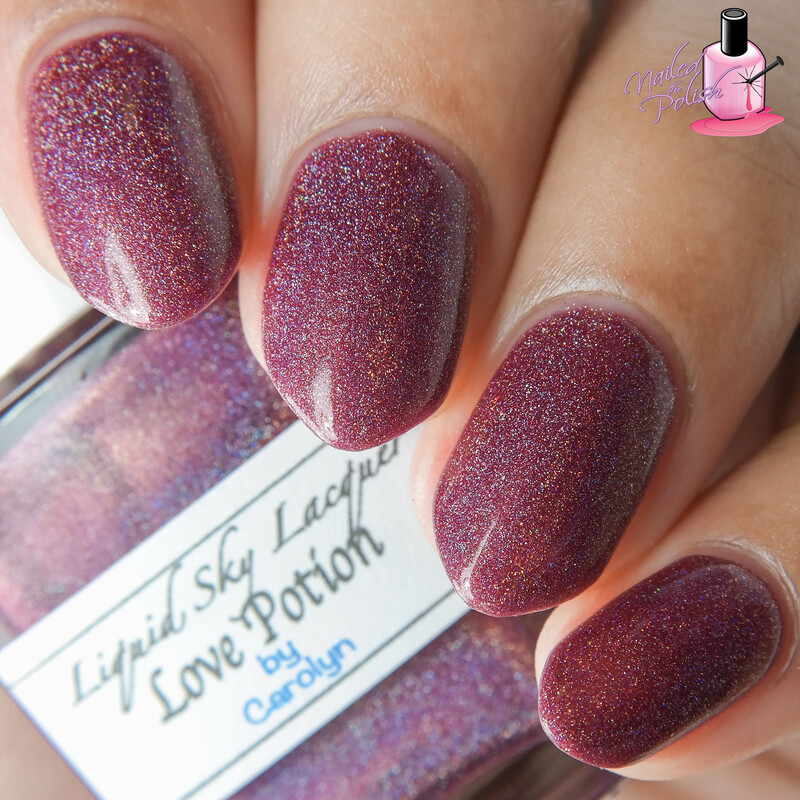 Love Potion is a gorgeous deep black cherry red linear holo with added gold shimmer. Shown here is three coats plus top coat. Formula is great! I reached opacity in two coats but I added a third to deepen the base color. I LOVE the color of this polish! I can say with confidence that I don’t have any polishes this shade. Definitely one of my favorites! 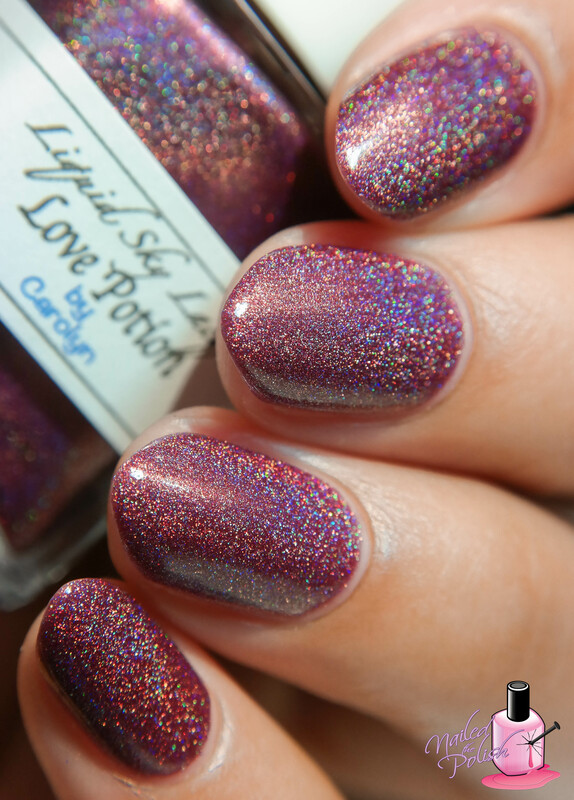 Compassion is a slightly pink red scattered holo crelly. Shown here is two coats plus top coat. Amazing formula with just as amazing coverage! The scattered holo is the perfect addition to the vibrant pink-red base! Heart Attack!! 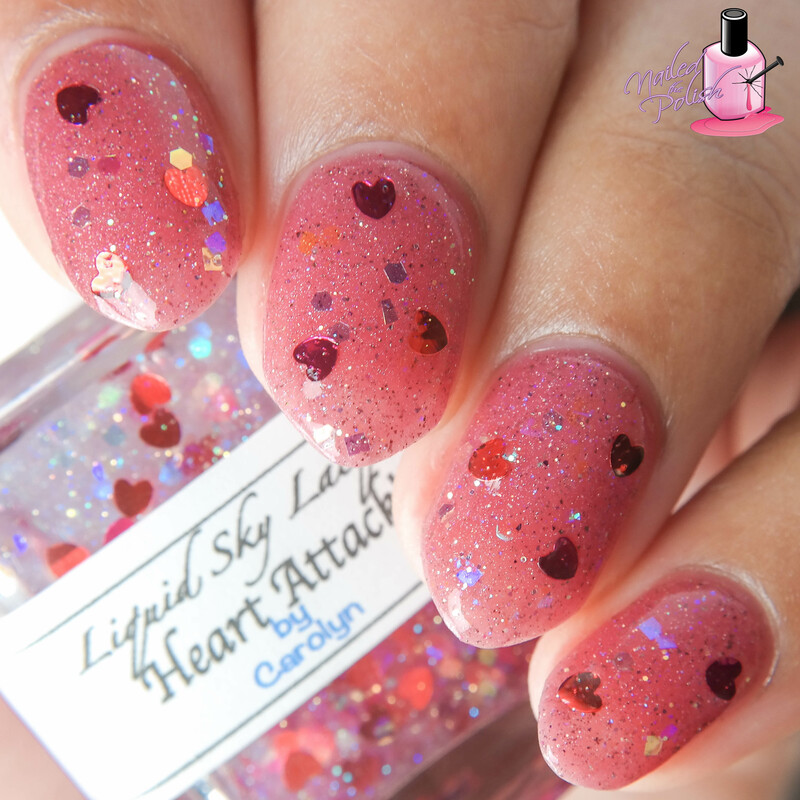 is a clear base glitter topper with red and magenta metallic heart and iridescent hex, square, and micro glitters – oh and iridescent flakies! 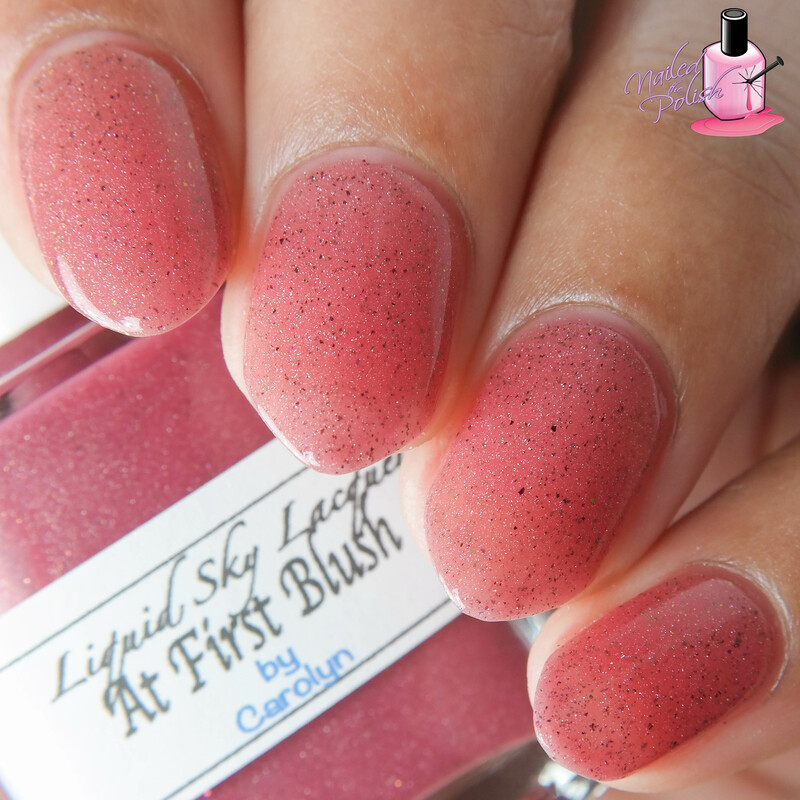 Shown here is one coat over At First Blush plus top coat. The heart glitters do settle at the bottom of the bottle so you need to turn it upside down for a few minutes. Once you do that, they are quite easy to get. This polish as a whole is pretty easy to apply. All of the glitters lay pretty flat and distribute well. 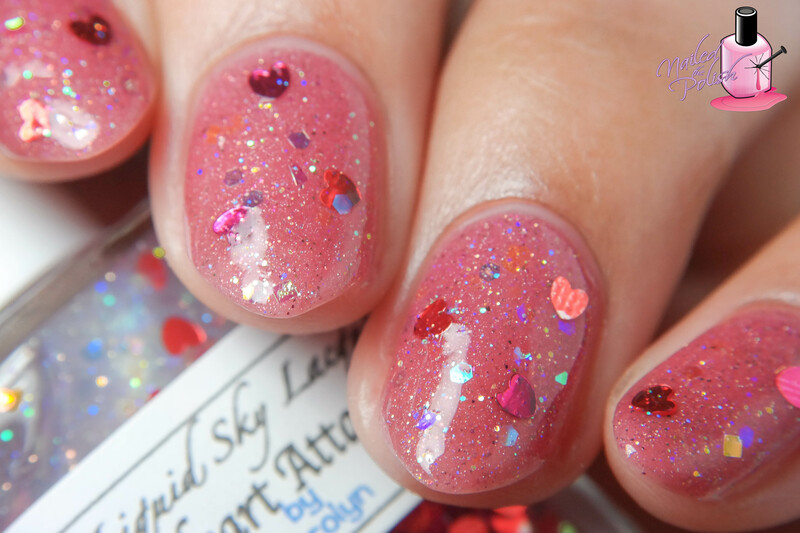 If you’re looking for a fun glitter that’s perfect for Valentine’s Day, this is it! Last up from the Valentine’s Day Collection is Passion – a deep, black cherry red scattered holo crelly with added metallic gold sheen. Shown here is three coats plus top coat. This polish is on the sheerer side but builds well. Other than that, formula is fantastic! There’s something about these black cherry red polishes – I just love them! I’m totally kicking myself for not trying Liquid Sky Lacquer sooner! This collection is great! I love how together all of the polishes are so cohesive yet individually, they are so different. Each polish has it’s own set of added elements that compliment their respective bases so well! While a few of the polishes are a little on the sheer side, all of the formulas are exceptional! My favorites are Love Potion, Passion, and At First Blush. The Valentine’s Day 2016 Collection as well as At First Blush are available now and can be purchased here. Each polish is priced at $10.50 USD with the exception of Love Potion and At First Blush which are $12.50 USD. The entire Valentine’s Day 2016 Collection is currently priced at $51 USD which is a savings of over 20%!!! These polishes were provided for my honest opinion.